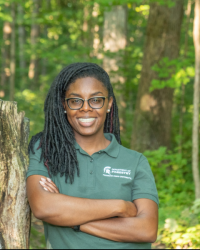 Asia Dowtin's research uses in situ sampling and laboratory-based techniques to quantify hydrologic and nutrient cycling in the urban forest. Her work explores the relationships that exist between urban canopy structure, spatial context, and plant-water interactions to broaden our understanding of the influence of species composition and surrounding land use on urban forest function. A major goal of Dowtin's work is to utilize this knowledge to inform the development of urban forest management plans, specifically those intended to optimize yield of select regulating and supporting ecosystem services by municipal trees. Her broader research interests include regional water resource management and hazard mitigation.